You are at:Home»Archive for "Brugmansia"
Brugmansia is a genus of 7 species of flowering plants in the family Solanaceae. They are woody trees or shrubs, with pendulous flowers and have no spines on their fruit. Their large, fragrant flowers give them their common name of Angel’s Trumpet, a name sometimes used for the closely related genus Datura. 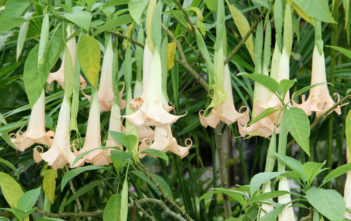 Brugmansia are native to tropical regions of South America, along the Andes from Venezuela to northern Chile and also in south-eastern Brazil.